The two patterns below are just a fraction of my whole range of blackwork kits and patterns. If you wish to order either, or both, of these medieval designs (which include all materials and the chart) please call 01529 461056. 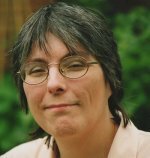 You may order the charts as downloadable files below. If you haven't tried blackwork before, you might like to check out my Blackwork for Beginners ebook. 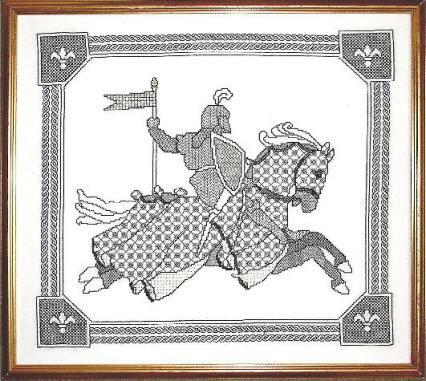 Somehow the intricate looking patterns in blackwork kits seem to call out to be used for a knight in shining armour. This jousting knight astride his steed gives the opportunity to stitch the horse's finery as well. A touch of gold on his shield and the lining of the horse's garment adds sparkle. Gold beads decorate the centre of each "flower" on the horse's caparison or ornamental cloth. 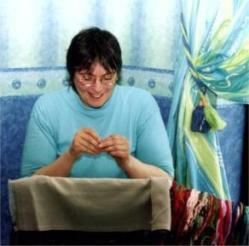 Simple enough for a beginner this medieval lady, Gwendoline, uses just black and gold threads. 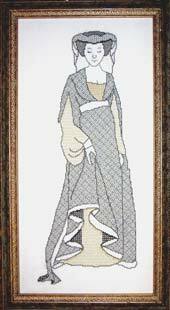 The pattern used for her dress is the same as the one used in the blackwork pears lesson.